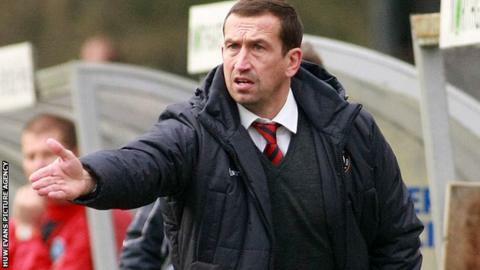 Newport County manager Justin Edinburgh says he has already started planning for next season even though the Exiles still have four games remaining. County all but secured their place in League Two with a 2-0 win over Wycombe last Saturday. Edinburgh hopes chairman Les Scadding will give him funds to build on their first season back in the Football League. "We've been planning for a while now," Edinburgh said. Former Tottenham defender Edinburgh had previously stated he was planning to make big changes during the summer. Defender David Pipe and midfielder Michael Flynn have already been told by Edinburgh they will not be offered new contracts at the end of the season. Edinburgh says identifying potential targets for next season has already started. "We had a busy week when we had a free week and I took in a lot of games, so we're well advanced and that will continue between now and returning for pre-season," Edinburgh added. "We'll be competitive. I don't think it's [the budget] going to be much more than this season. "But I think I will be able to build another squad that we can continue to progress and establish ourselves as a Football League club." County are seven points clear of the relegation places following last Saturday's victory over Wycombe, their first home win in 10 games. Edinburgh now wants his side to finish the season strongly with Friday's game at AFC Wimbledon the first of four remaining league games. "Obviously it's not mathematically safe but I think we've hit the target that would keep us in the Football League for next season," Edinburgh said. "We won't be looking at that, we'll try and collect as many points in the remaining games and try and get some consistency going. "Over the last eight to 10 games we've shown a lot more consistency than we did in the first part of the new year." Striker Aaron O'Connor is set to be included in the squad for the trip to Wimbledon having not featured for the Exiles in League Two this season. O'Connor, 30, was last season's top-scorer but has been out with groin problems all season and underwent surgery, but Edinburgh is hopeful of a return before the end of the campaign. "Aaron O'Connor's trained all week and if there's no reaction from [Wednesday's] training then he'll be in the squad for Friday's game," Edinburgh said. "It's fantastic news for himself but also for everyone connected with the football club."